In terms of its style and subject, The Unknown Known feels like a spiritual sequel to director Errol Morris' Oscar-winning documentary The Fog of War. Both turn Morris' deeply unnerving Interrotron onto the faces of former Secretaries of Defense who presided over long, disastrous wars (in The Fog of War, the Secretary was Robert McNamara and the war was Vietnam; in The Unknown Known, the Secretary is Donald Rumsfeld and the wars are Afghanistan and Iraq); both offer overviews of the personal lives of their subjects as well as their political careers; both supplement their near-unbroken eye contact with archive footage, occasional flashy graphics and insistent, faintly menacing music. Outside of those formal similarities, the films are markedly different since McNamara and Rumsfeld are fundamentally different men who address their tenures as Secretary of Defense from very different perspectives. When Morris interviewed him in 2003, 35 years had passed since McNamara left the Pentagon and the war in Vietnam was long over. He had clearly spent years ruminating on his actions and their consequences and he was very candid about his failings, so much so that the film was loosely structured around the different "lessons" that could be taken from his experiences. By contrast, it has only been seven years since Rumsfeld resigned as Secretary of Defense, and both of the wars he helped orchestrate are still ongoing. If he has spent any time reflecting on the possibility that he was wrong, it doesn't really show in the documentary, and he certainly has no lessons to offer, possibly because he hasn't learned a damn thing. Despite the candour and wit that he often displayed in briefings, Rumsfeld is fairly cagey in The Unknown Known. He never stonewalls or deflects Morris's questions, but when pressed on how his actions might be perceived - such as the theory that he pushed for George H.W. Bush to be made head of the C.I.A. in 1975 as a means of destroying Bush's political future - he states pretty definitively that other people are wrong, or that they have the wrong impression of him. Any suggestion that he was a Machievellian schemer is laughed off with a grin that looks like it has been practiced in front of a mirror on many, many occasions. He's never hostile, and at times comes across as close to avuncular, but he also gives the impression that he is putting on an act. Rumsfeld understands how to work with a camera, and while Morris occasionally uses archive footage to refute something he says (such as a telling moment in which his denial that Americans were confused over Saddam Hussein's connection (or lack thereof) to Al-Qaeda is juxtaposed with footage of him saying in a Pentagon briefing that Hussein lied when he denied any connection to Al-Qaeda or 9/11), Morris lets him tell the story in his own words. Those words are occasionally said over eerie time-lapse photography and unnerving strings, certainly, but they are never anything other than his own. Words in general seem to fascinate Rumsfeld, who has a linguist's interest in their precise meaning and effect. He talks about how carefully he crafted the, by his estimate, millions of memos that he sent out as Secretary of Defense, as well as his habit of recording his thoughts into a dictaphone so that he could better understand his thought process. Considering how careful he seems about saying what he means and meaning what he says, it's curious that so many of the things he says feel like they are loaded with double or triple meanings. This could be the result of Morris' deliberately jagged editing, which shifts his subjects about the frame and so makes his confessional approach even more uncomfortable, but I don't think that's the case. When he says, for example, that Saddam Hussein acted like a caricature of himself and believed things that weren't true, he holds a smile that lasts about five seconds too long, almost as if he as been stricken by some form of poignantly ironic rictus. In that instant, is he accidentally saying something that could apply just as easily to the Bush administration as it could to Saddam, or is there something subconscious happening? In his dealings with Morris, he comes across as someone who is either completely bereft of self-awareness, or so profoundly self-aware he now lives his whole life between quotation marks. The title The Unknown Known comes from a famous memo and press conference in which Rumsfeld divided and described different kinds of intelligence. It's a snappy, evocative title, and one that is so indelibly tied to the man who coined it that you know what the film is about from those three, oddly poetic words. But within the context of the film, it has two distinct meanings. In Rumsfeld's original memo, "unknown knowns" are defined as "things that you think you know, that it turns out you did not." That definition is offered at the beginning of the film, and implies that Morris' aim is to offer some insight into a controversial figure, one that many people have already made their minds up about, by forcing them to confront what it is that they think they know. But as the interview progresses, Rumsfeld offers a different interpretation. His new definition is that "unknown knowns" are "things that you possibly may know, but you don't know you know." It may be getting too far into the weeds, semantically speaking, to push this point much further, but the difference between the two definitions is striking. The first relates to hubris and short-sightedness because it's clearly about presumptions that are proved wrong. The new one relates to intuition, perhaps coupled with a lack of imagination, because it's about possessing information without fully realising its importance. It's one of the more clear-cut examples of Rumsfeld using the documentary to present his own vision of history (perhaps one in which what was actually said is less important than what was intended to have been said) but it also cuts to one of the big questions at the heart of the film: what kind of "unknown known" is The Unknown Known presenting to its audience? Is it trying to show us that what we may have thought about Donald Rumsfeld is wrong? Or is it saying that what we may have believed about him was correct all along, but in ways that we may not have previously considered? Or is it, to paraphrase Slavoj Žižek's definition of an "unknown known", an examination of someone refusing to acknowledge things that they do know? In all honesty, I'm not sure which of those fits the film best, since it mostly comes down to what you feel about Rumsfeld going in, as well as what you get from spending so much time in his company. 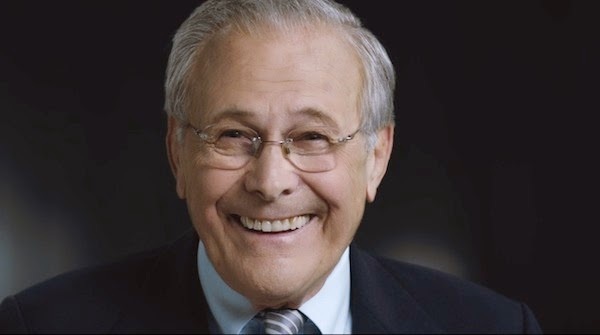 It certainly doesn't provide many answers, because Rumsfeld himself doesn't offer many satisfying ones - even why he agreed to be in the film in the first place - but it's certainly a provocative and compelling glimpse into the abyss.